Through deep research and development, we create new-generation property / exposure location information and insights by integrating various thematic layers (including terrain, land cover, climate-warming trend, natural hazard risk and the environment) from a single dimension to 2D/3D/4D and across geographic scales. We also examine how such information can be more effectively communicated to the general public in a visual way via mapping, graphing and animations, including the use of Augmented Reality techniques. 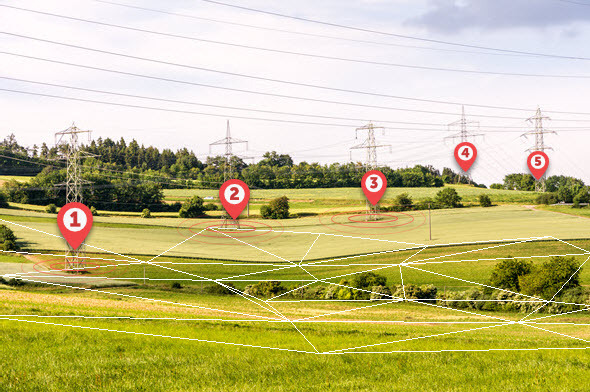 As each individual is unique in its biometric data, every property can be characterised by a set of distinctive, location-specific terrain and environmental attributes (or “identity features”). Our environment is constantly measured by a host of spaceborne, airborne and terrestrial observing systems. Acquired high-quality geospatial data, including high-resolution open data released by government agencies and proprietary data by commercial vendors, are essential to accurately quantify the location information of individual assets. 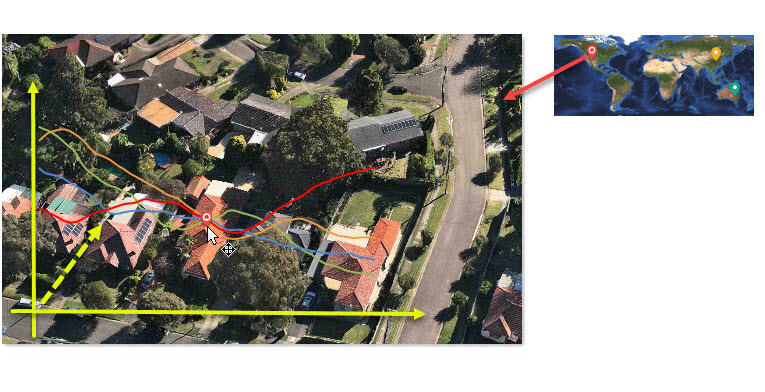 For example, in Australia, the 5m-resolution elevation data from Geoscience Australia and the population & housing data from the Australian Bureau of Statistics (ABS) can be explored for this purpose. 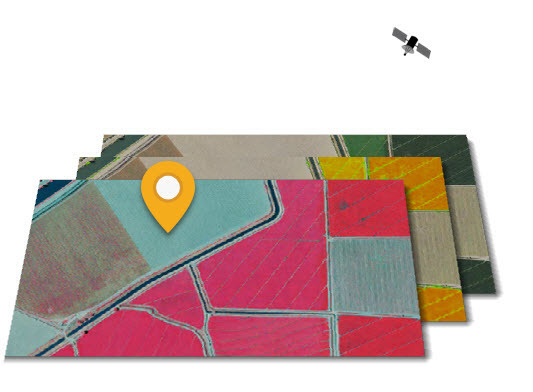 Similarly, in the U.S., the National Elevation Dataset (NED at 10m, 3m and 1m resolutions) from the USGS and the aerial imagery from the USDA National Agriculture Imagery Program (NAIP at 1m resolution) are great resources for this type of applications. Property location information is integrated and multidimensional in nature, and should take into account attributes such as terrain, land covers, climate change and natural hazards (e.g. wildfires, riverine/flash/coastal floods, severe storms and liquefaction). Each attribute may be examined across scales, from the most granular level (i.e. site level) to street and suburb levels. 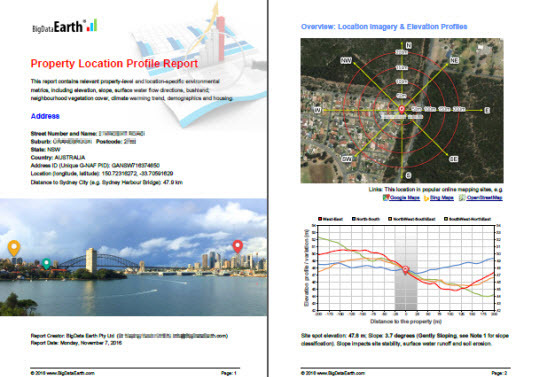 Detailed property location profiles or information reports for sites in Australia and the U.S., and broad-level property location profiles for sites in other countries are being developed and offered. We research more than 20 fresh location metrics for various types of properties, develop efficient mapping and analysis systems, and readily make information-rich reports (typically in PDF format) and animations. The new property location information report goes beyond common imagery and basemaps, and focuses on spatial measurement and modelling which enables users to make informed location-based decisions. Some examples are shown below. 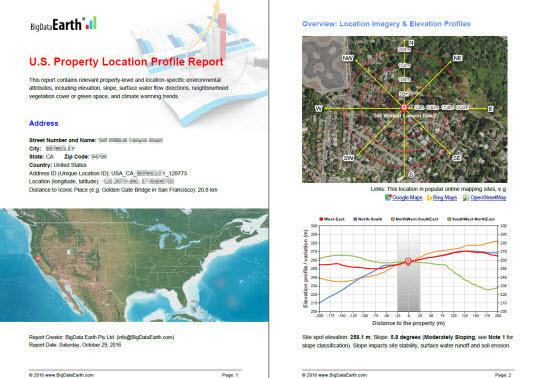 Figure 1: Examples of location profile reports in PDF format. 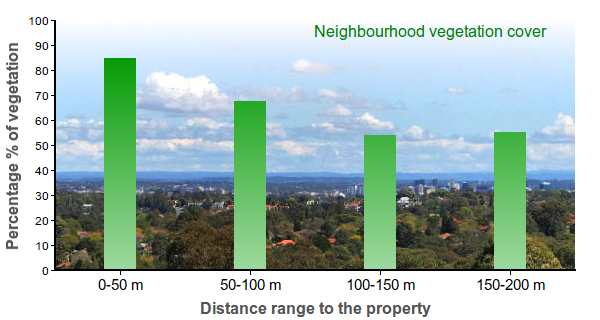 Figure 3: An example of location profile for land covers: measuring neighbourhood vegetation cover that represents community green space. 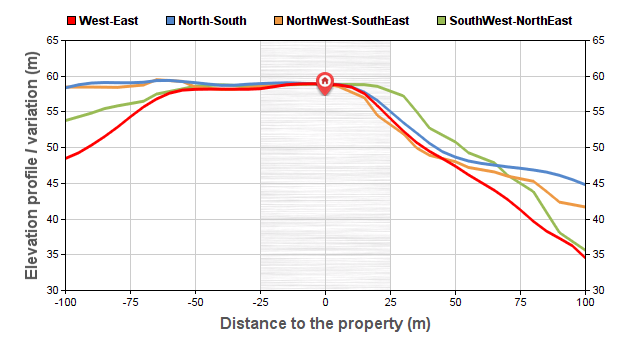 Figure 4: An example of location profile for site-level terrain: elevation profiles at four cross sections. 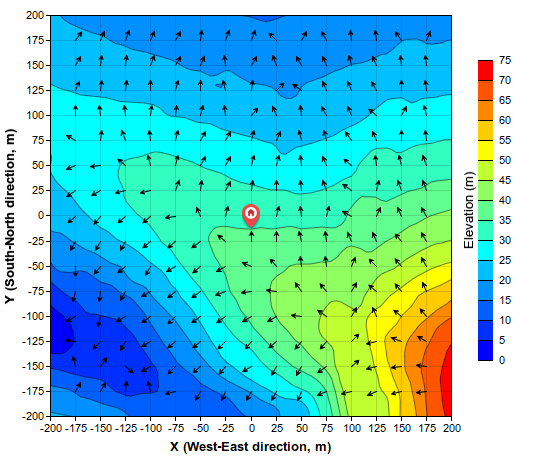 Figure 5: An example of location profile for natural hazard risk: surface water flow directions. Contextual and process-oriented geospatial layers are included to augment traditional risk scores. 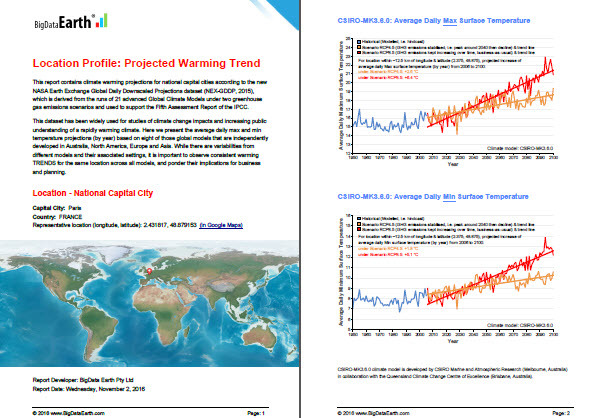 Figure 6: An example of location profile for climate warming projections / trends. 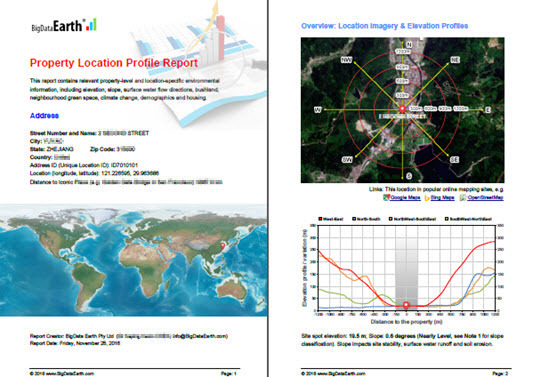 Sample reports for various worldwide locations can be found at the specific project website. 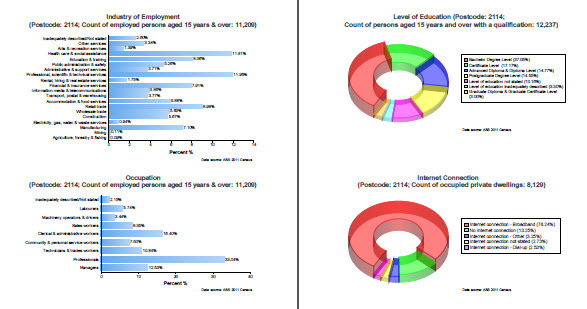 Figure 7: An example of location profile for population and housing using government census data.